This week we will visit the small holiday destination village of Gordon's Bay which is situated in the north eastern corner of False Bay against the slopes of the Hottentot's Holland mountains . Gordon's Bay has quite an interesting history and dates back to the 1670's when the Dutch started to take an interest in the area. 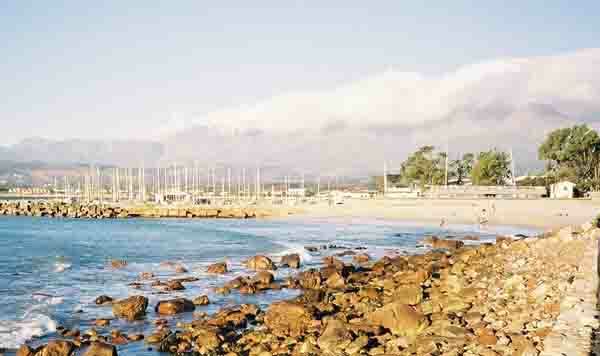 In 1672 the Dutch East India company established a fishing post at Gordon's bay and called it Vischers Baaij. Robert Jacob Gordon the Commandant of the Dutch troops at the Cape from 1777 to 1795 named the area Combuis (Kitchen) as the area was rich in game and had plenty of water The name however did not stick and the bay became known as Gordon's Bay. In 1678 the first Free Burghers were given leasehold land in the area and soon more and more farms were established. 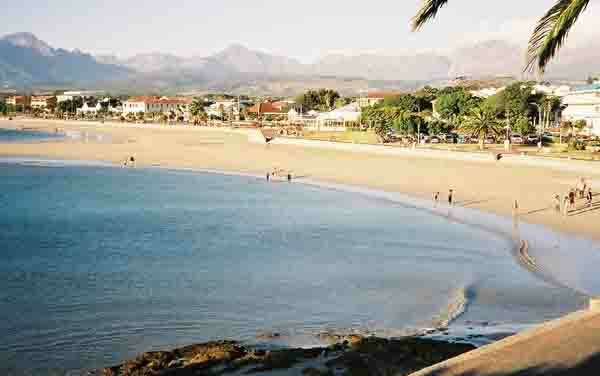 Gordon's Bay became a very popular picnic area during the following years. Today the place is a bustling village with plenty of residential properties shops and hotels. When the wind dies down one cannot find a spot on the beach. The sea water is normally lovely and warm and one can just lie and soak in it and on the lovely sandy beaches as well. As I mentioned earlier Gordon's Bay was well known for its good fishing so it was inevitable that a small boat harbour would be built there. Many fishing boats launch from this harbour to fish along the cliffs of the Hottentot's Holland mountains and also off the beaches on the coast of False Bay. The harbour provides anchorage for yachts and other small pleasure craft as well. On the south side of the harbour is the harbour wall which extends out into the bay. Its from here that anglers cast their lines to catch some of the fish that frequent the area. I've fished there on many occasions and caught many small sharks while fishing at night. Other fish caught are the Steenbras and the Kob, both popular eating fish. Between The Gordon's Bay Harbour and the beach the Navy has established a training facility called The General Botha Naval Academy. It trains its naval cadets there. High up on the slopes of the mountain above the base the cadets have built a signpost of white painted rocks where they identify their base with a large GB with an anchor placed between the G and the B. It can be seen from miles away. Most people who see the sign for the first time would think it stands for Gordon's Bay but it does not. There is a well worn path from the base to the signpost as cadets are often sent up the mountain for fitness training runs. To the south of the harbour is a small bay and beach which is a real jewel along this piece of coastline. It's called Bikini Beach and becomes one during the long lazy summer that the Cape experiences. To get onto this beach, the trick is to get there early. Parking is usually at a premium and the traffic cops have a field day writing tickets for illegal parking. On the slopes of the mountain just above Bikini Beach is an old house which has all but fallen down. The owner of the house locked it up, left and never returned. To this day his whereabouts are still unknown and thats in excess of thirty years of his departure. Its becoming quite an eyesore right in the middle of some prime land with excellent views of the bay. From the dam there is a hiking trail down the river gorge to the sea. Near to the mouth of the Steenbras river are a number of pools where one can swim. The mouth can be rather dangerous when the sea is rough as large waves enter it. Fishing is popular from the rocks in the area but can be treacherous as the many crosses peppered along the coastline bear witness . Fishermen often get washed off the rocks by freak waves and are drowned. Visitors to Cape Town should make an effort to visit this little jewel that is Gordons bay tucked into the corner of False Bay.